One decanter in ALVR’s collection is adorned in such a way that speaks to vodka’s significance in Russian history and culture. It was designed around the year 1900 by Elizabeth Bem (1843-1914), an artist most well-known for her popular postcard designs and children’s book illustrations. Her works of glass are just as highly regarded and she received significant recognition for them at many world’s fairs. It’s so wonderful, my sunshine! Drink-drink, and devil you’ll see! And third – I have had a drink already! Got drunk, broke in fight! 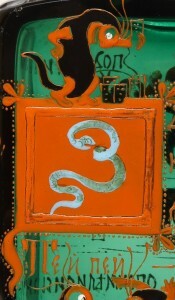 Also of note is a green serpent in an orange box in the upper left corner of the decanter. 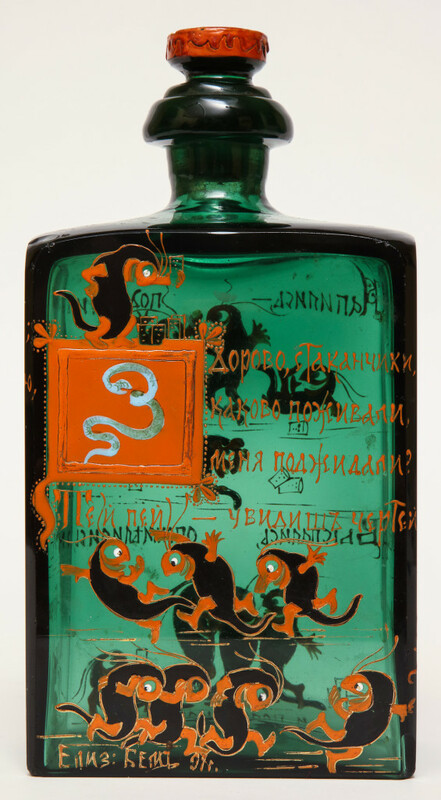 “Zelyony zmei,” or, the’ green serpent,’ is a Russian nickname for vodka that references both drunken visions and the coils of the pipes involved in distillation. 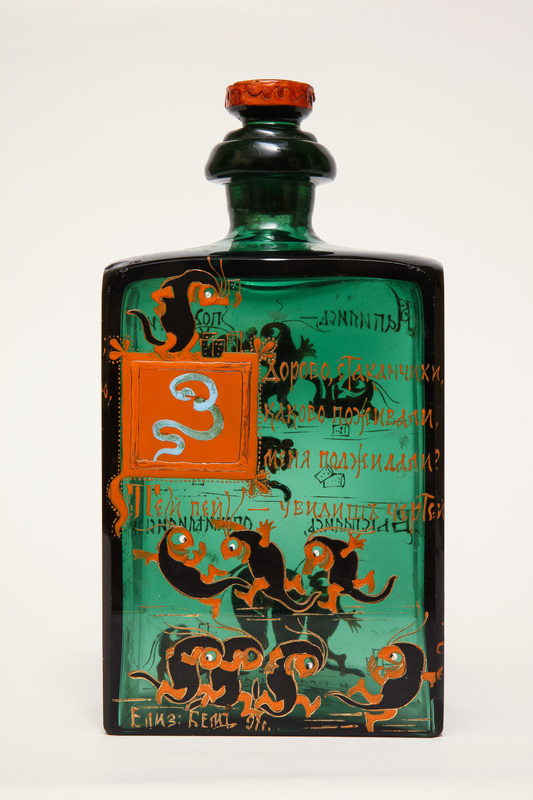 The coil, or ‘serpent’ had to be especially made, making vodka more expensive to produce than beer, mead, or kvas. 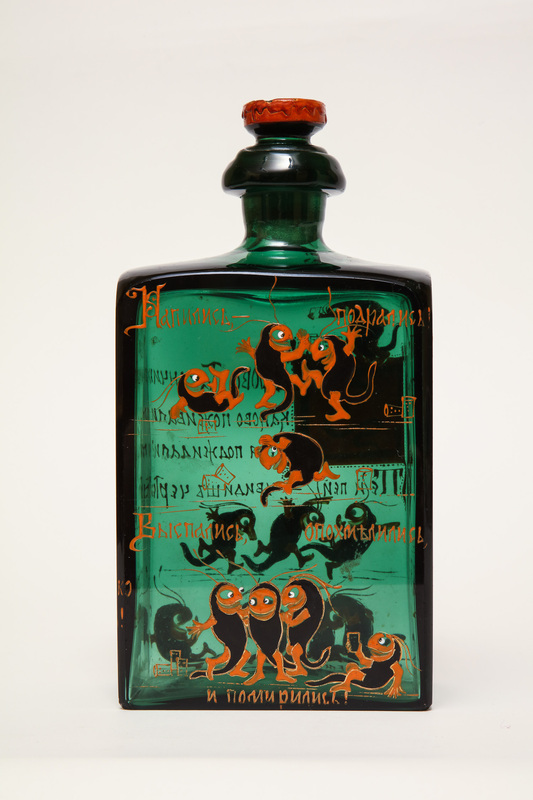 It’s believed that the image of the coil within poorly distilled muddy-green vodka inspired the ‘green serpent’ metaphor. Bem appears to play on this reference with both the addition of a serpent and the green hue of the glass. Vodka’s fiscal benefits were first realized in the sixteenth century during the reign of Ivan IV (“The Terrible” 1533-1584). In the 1540s Ivan opened a few kabaks, or taverns, with the intention of using the profits to fill the state treasury. And so began a state monopoly on vodka production. 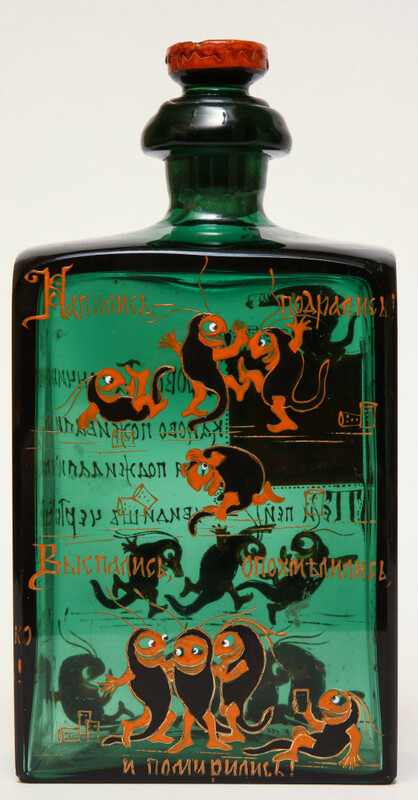 Subsequent rulers introduced various laws to control vodka’s production and consumption. Peter the Great (rumored to drink up to half a gallon of vodka a day) created liquor licenses to constrain home-brewing, only to later rescind such restrictions. 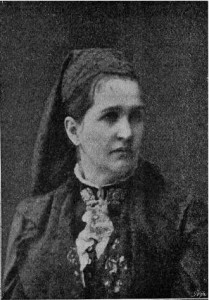 Catherine the Great limited production to the aristocracy, which helped improve vodka’s quality and fill the state treasury. Vodka’s fiscal contrition continued to rise and by the nineteenth century it became the single most important source of government revenue. That an inebriated public was easier to rule did not go unnoticed. In fact, some historians attribute Russian sobriety to the Romanov downfall. In 1914, Czar Nicholas II was so troubled by rampant drunkenness that he made alcohol illegal. The revolution can’t be attributed to Russian sobriety alone, but lifting the drunken spell certainly must have helped. Prohibition lasted until 1925, coincidentally, when the Bolsheviks began to run low on funds. Why do Russians drink so much? For one, alcohol consumption has always been linked to Russian spiritual and social life. From the many events on the closely intertwined church and agricultural calendars to a long list of other holidays, there has always been an excuse to raise a glass…or drain a bottle. Russia’s long cold winters also play a role. After all, vodka warms both body and soul! Russians also believe vodka has medicinal qualities. Truly an “elixir of life,” there is nothing vodka can’t cure. Economically, socially, culturally… even medicinally, this special Russian “water” has been vital to Russia’s existence. So here’s to life, vodka, and ЗА ВАШЕ ЗДОРОВЬЕ! (to our health)! David Christian. ‘Living Water’ : Vodka and Russian Society on the Eve of Emancipation. Oxford University Press, 1990. David Christian. “The Green Serpent: Vodka, Marx and Primitive Accumulation” in Eat History: Food and Drink in Australia and Beyond. Cambridge, 2013. Edwin Trommelen. Davai! The Russians and Their Vodka. Russian Life Books, 2012.